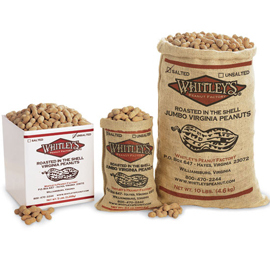 The famous "Home Cooked" Virginia Peanut! Crunchy, fresh and distinctive. 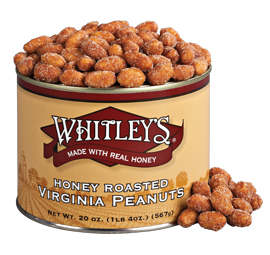 One bite and you'll taste why these peanuts are our most popular selection. "Like no other peanut you've ever tasted!" Ingredients: Peanuts, Vegetable Oil (Contains one or more of the following: Coconut, Cottonseed, or Canola Oil), and Salt. 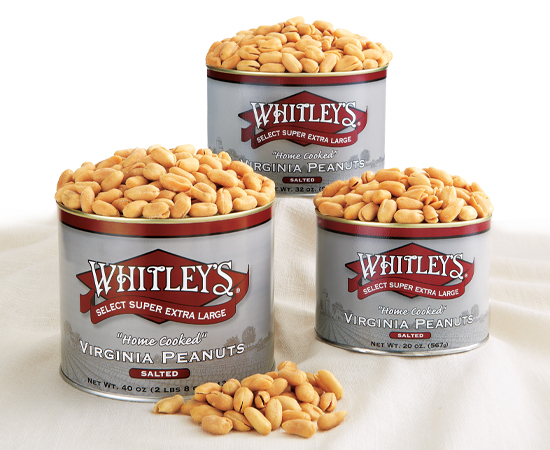 Since my family found Whitley's peanuts while on a vacation to Virginia, there simply are no other peanuts that measure up to the large crunchy best peanuts around. They make great gifts for any occasion. The quality can't be beat. I also like that the shipping cost is included in the price. Thanks Whitleys for making such a high quality product. We always visit your store when we are in the area. The Styers in Pa.
My Mom gets tins of salted peanuts every year for Christmas. The best nuts ever! Not a peanut guy... BUT these are Great!!! Received the 20oz tin as a gift. I'm not a huge peanut fan but I couldn't stop eating these! Very firm and crisp, never had any like them before. They are excellent! I've been getting these peanuts for many years but this is the first time I've written a review. They are so delicious...I keep buying them again and again! 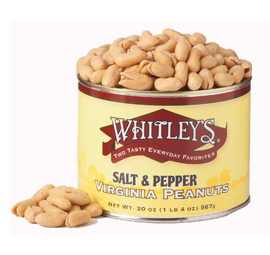 Having tried a number of other peanuts, these are far and away the BEST. Love the salted, and the cashews got a great review from a friend. These peanuts are not for everybody - (see H. Lee's review) but for the rest of us that CAN figure out the difference between plastic wrapper and a can they are the world's best! Looking forward to receiving my next order! 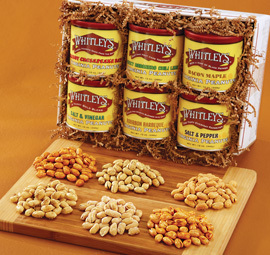 I had bought from whitley's before and love the quality of the peanuts. I thought I ordered 6 tin cans of peanuts for christmass giving only to find out I accidentally ordered 6 cello bags of peanuts instead. It is a big deceiving in the website. There is a tin can of peanuts on the left but a long list of different packages. The cello bag is definitely not fit for gift presentation. So take time to read the item description. Best online, store bought, anywhere bought peanuts!!!!! Fast shipping and nice catalogs also. The absolute best peanuts around!